Comments: A new season is upon us…well me anyway. I’ve managed to avoid seeing Fulham, or any other live football for that matter, all the way till October. A mighty impressive feat when you consider I once went to watch Fulham play a Europa Cup qualifier qualifier in Lithuania in July. 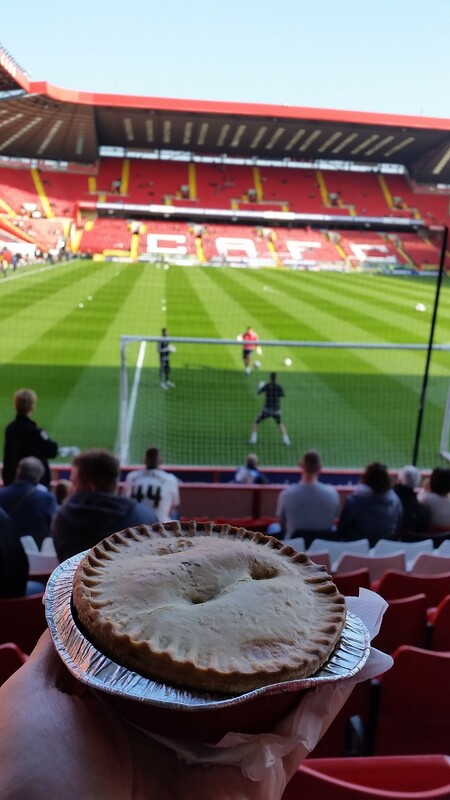 Most importantly a trip to Charlton ushered in the first pie of the season! “Horray!” the legions of loutish middle aged men roar. First things first, ignore the pie, just look at Charlton’s absolutely wonderful pitch. It’s hard to even conjure a superlative worthy of that green velvet pleasure pitch. It was an absolutely stunning slice of turf that didn’t deserve to be desecrated by the derisory footballing talents that flopped and flapped across it that afternoon. Despite both teams being void of any killer instinct the game was an end to end affair with plenty of excitement – mostly brought on by ineptitude and errors. Far from entertaining but full of errors was my Balti Pie. After a poke of chips, noteworthy for the fact the ketchup was so weak it almost evaporated, I forced a pie upon myself. I wished I hadn’t, it was utter shite. As soon as it landed in my palm I knew i was in trouble. Looking down I could only see a plaster board style roof rather than anything that resembled pastry. Biting into the pie was what I imagine it’s like to chew on the off-cuts of a Black and Decker sander. Dry, claggy and tasteless should have been stamped on this unfortunate specimen. I clawed out the Balti entrails in a futile attempt to salvage something positive. The scraggly orange slithers were far from substantial and just about grazed my hunger. And how much did this (dis)honour cost me? An opportunistic £4. In the words of Johnny Rotten; Ever get the feeling you’ve been cheated? I felt aggrieved at being duped into buying one pie, but I can only imagine how depressed the poor Charlton fan was who won a whole crate of the monstrosities before kick off. Although in saying that, they would come in quite handy for pelting Kit Symons – the only thing in The Valley more useless than the atrocious pies.